Adopted on June 30, 2013. 2013 Wisconsin Act 20 designated the kringle as the state pastry on June 30, 2013 when Gov. Scott Walker the $70 million state budget. 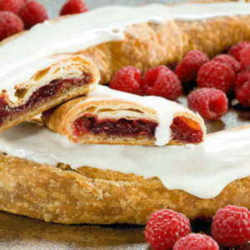 The kringle is a flaky dough pastry that can be filled with fruit, nuts, or other filling and baked with icing. 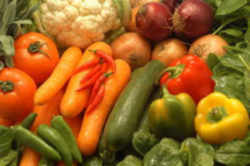 The proposal was supported by the city of Racine, as they are a mass producer of the pastry. Kringle is a Scandinavian pastry, a Nordic variety of pretzel, which arrived with Roman Catholic monks in the 13th century, especially in Denmark. It developed further into several kinds of sweet, salty or filled pastries. In the United States, kringles are hand-rolled from Danish pastry dough (wienerbrÃ¸d dough) that has been rested overnight before shaping, filling, and baking. Thirty-two layers of the flaky dough are layered, then shaped in an oval. After filling with fruit, nut, or other flavor combinations, the pastry is baked and iced. The Kringle became the Official State Pastry of Wisconsin on June 30, 2013. Racine, Wisconsin has historically been a center of Danish-American culture and kringle making. Kringles and Danish culture are an important part of Racine's cultural identity. A typical Racine-made kringle is a large flat oval measuring approximately 14 inches by 10 inches and weighs about 1.5 pounds. 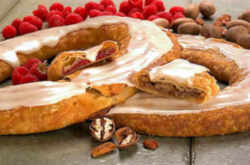 Racine Danish Kringles and O & H Danish Bakery, are two destinations in Racine, Wisconsin specializing in Kringles. A Wisconsin distillery, Nordic Distillers of Middleton, Wisconsin makes a Kringle Cream liqueur from real Wisconsin cream, rum, sugar and natural Kringle flavor.. In other parts of the United States, kringle refers to a slightly sweet, buttermilk cookie shaped like a pretzel or figure eight. 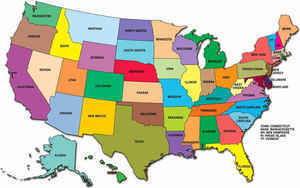 The Ballard area of Seattle, Washington; Solvang, California; central Iowa; and Burr Ridge, Illinois are among other places to find kringles in the U.S. In 2005, Dana College in Blair, Nebraska, held a Kringle Kontest, which was won by Kirsten's Danish Bakery in Burr Ridge, Illinois. MADISON - The state of Wisconsin has finally named the kringle the official state pastry. The kringle is popular among the Danish population of Racine, and one Racine legislator put his support behind the decision. "While there are many items in this biennial budget about which Republicans and Democrats disagree, I am glad that my colleagues and I can find common ground around my suggestion to designate the kringle as Wisconsin's Official State Pastry,"Rep. Cory Mason wrote in a letter to Gov. Walker, according to the Capital Times. The cream puff was proposed as the state pastry back in 2012, but it died in the Assembly. The kringle was made official Sunday when Gov. Scott Walker signed the $70 million state budget. (t) The kringle is the state pastry. (4) The Wisconsin Blue Book shall include the information contained in this section concerning the state song, ballad, waltz, dance, beverage, tree, grain, flower, bird, fish, animal, domestic animal, wildlife animal, dog, insect, fossil, mineral, rock, soil, fruit, tartan, and pastry. History: 1971 c. 14, 129, 167, 228, 307; 1977 c. 326; 1983 a. 33; 1985 a. 162, 295, 332; 1987 a. 279; 1989 a. 162; 1993 a. 411; 1999 a. 83, 186; 2001 a. 16; 2003 a. 174, 321; 2007 a. 217; 2013 a. 20.